“Well of course I´ve seen an anaconda,” Monica Chichaco says, as she weaves an anaconda design from memory. “It´s three, maybe four, meters long,” she adds. Monica´s husband, Beder, has prepared her workspace by banging a few nails into the floorboard in the living room. 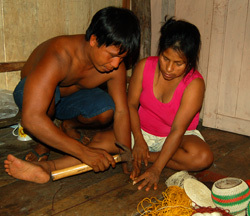 Monica uses these nails to secure her chambira fibers for the maroon and white anaconda belt. Beder says that he and his wife always work together. “Of course, she is the master,” he adds. “I just help.” As she weaves, Monica nurses her six-month-old baby, Mayronela. When Mayronela cries, Monica swings her to sleep in the hammock and then returns back to work. Monica´s 11-year-old son, Willy, and four-year-old daughter, Darcy, peer over her shoulder. The entire family is gathered in the living room, sitting on the floor beside a baby stroller, a boat motor, and a pile of palm leaves that Beder will use to fix the roof. Ten pairs of baby jumpers hang overhead on a clothesline. This is where Monica works and lives with her family, together. 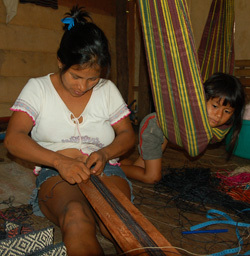 Monica is one of the top artisans making different colors of the anaconda models of the Amazon guitar strap. These straps are woven from strong chambira palm fiber into patterns of jungle snakes with mostly plant-based dyes. See photos of all models of the Amazon guitar strap. Romelia has gentle, knowing eyes that inspire immediate trust. She offers visitors cool drinks from her closet-size bodega (general store) and happily shows them the trees, bushes and herbs she grows around her house to heal various ailments. 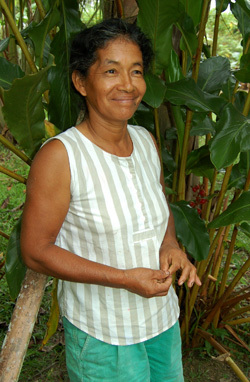 Romelia was already a veteran artisan when Amazonia Expeditions opened an upscale ecotourism lodge less than a mile from Chino. 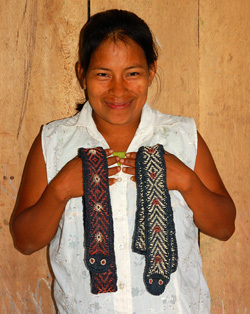 Her attention to detail inspired others in the village to start making crafts to sell to guests at the lodge. 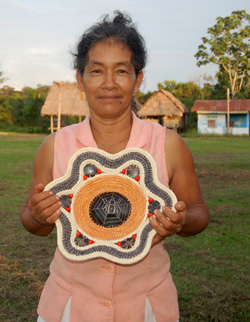 They began making typical baskets and then began weaving rainforest seeds into their creative baskets, which are now sold in gift shops in Iquitos and San Diego and by the Center for Amazon Community Ecology. 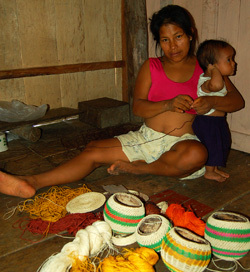 Romelia sells about 20 baskets a year and also makes bags, woven vases (“tinajas”), and woven pots with tops (“mocawas”). She sometimes puts a piece of shell from the fruit of a calabash (“wingo”) tree in the center of a decorative basket. The green fruits are dyed a lustrous black with a liquid made from the bark of the cumaca tree. 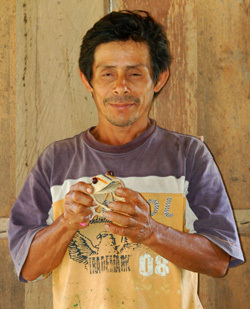 Romelia’s husband Jorge is also an accomplished artisan who weaves frogs from chambira fiber and carves jungle animals from wood. The Center for Amazon Community Ecology sells baskets made by artisans from El Chino at the ticket office and periodic concerts at The State Theatre.